I'm getting that error too. On my Admin control I have an option to delete the attachment. I checked to see if "delete" simply meant "remove from post" or "delete image from server". It seemed to only remove it from the post, as all the links worked when I previewed my changes. But now they seem gone from the server too. I wonder if it simply delays deleting it from the server. I backed up one of the images, so I resored Saturn0p185Detail.gif but I think the others are gone. I hope you still have them. If so, you can e-mail them to me, and I'll upload them to a different folder, or you can re-attach them, and I'll modify them, but this time without deleting them. The straight line one was weird. You can't seem to recreate the simulation? If you can, post the .gsim. I'll reattach them the next days. The weird .gsim : no I can't reproduce it . 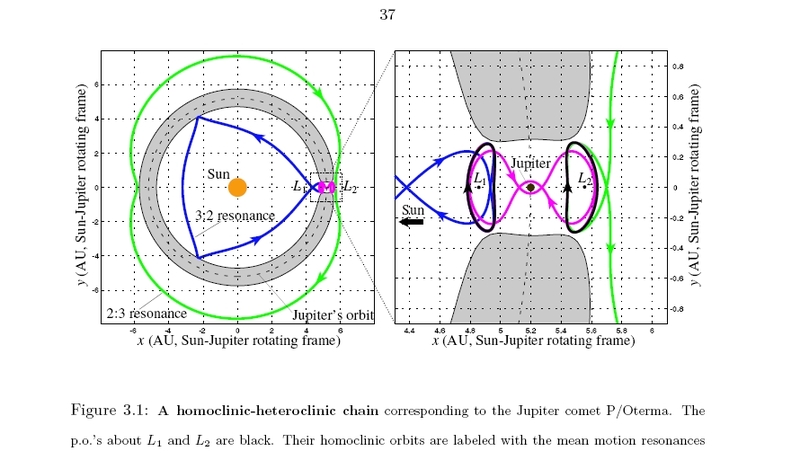 For the solarsystem a Hill radius of 0.155Au to Jupiter seems to be a configuration at the edge of stabilty ( in this orbital configuration starting at 2037) . The simulation covers almost 100 years and consists of 400 individual frames. One can see the system "wind up" for several tens of years , then some bodies escape to the inner solar system over the L1 point one after another . Watch how Jupiter seems to shoot every time it is near aphelion . Only a few escape over L2 , leaving their orbit towards the outer solar system . The animation appears to be of "poor" resolution or quality . This is due to the scaling and the reduction of colors and compression in order to fit the 1MB upload limit . The original amount of data before compression was about 1GB in bmp. I'm wondering if I'm seeing things here. Follow the path that the particles make after they've left the hill sphere - is it me or does it look like they're in a triangular orbit? Isn't that usually seen with a 3:1 resonance? Re: Hill Sphere period - resonance ? Some of them do get close to a 3:1 resonance, but not exactly, so the triangle drifts a lot from one resonant period to the next. It's probably impossible for something to escape the planet and go into a resonance. The objects in the Hill sphere were created referenced to Jupiter . Later they will orbit the sun . In the output values for SMA,e,...they appear still referenced to Jupiter . Can one change this values so the output become related to sun? An interesting thing about the objects that are right at the edge of stability, is that they can complete several orbits before being stripped away by the sun. When they escape the planet, they always do so through the L1 or L2 points. Then after orbiting the sun a few times, they get re-captured through the L1 or L2 point, complete a few orbits and then get ejected again. It's fun to watch in the rotating frame as the positions of L1 and L2 are easy to spot. Sit back and watch as these objects escape Jupiter through the L1 and L2 points, orbit the Sun for a while, and get recaptured through the L1 and L2 points. Here's a representation from it's work . It is highly mathematical . By chance I discovered in the work of Ross the orbit of Comet Oterma. Re: Hill Sphere period - evolution of orbital .. In one of the above posts I posted an animation of 100 bodies around Jupiter , which are on the edge of stability at 0.155 AU from the planet . Some of them escape after a while , others remain bounded . Hereunder is a dynamical plot of the evolution of the SMA and Eccentricity of each body in time . Enjoy the choreography in the beginning of the animation ! A general feature of the dynamics is the fact that systems evolve towards a chaotic stability out of a pure symmetrical initial state . ( It would be quite sensational to run the simulation backwards ! ) . I whished I could provide the code or executable to generate these plots here on the forum , but the program still needs some manual input in order to set the scales before compiling . I've run the following sim again : it contains 300 bodies at 0.155AU around Jupiter , and outputted the a, e, i values every 5 days . I used 256 as timestep . Doing so the orbital parameters' evolution in time can be represented in much more detail. PS : its nice to see how the initial circular orbits change over time when running the gsim . The system was simulated till the configuration looks as the first picture . Advantage of this small timestep of 5 days is that the evolution of individual bodies becomes clear as one can follow the bodies individually .